Especially considering that it's also hitting shelves this month in its Criterion Collection release, if you haven't seen Louis Malle's 1981 art-house cult classic My Dinner With Andre in awhile, you may want to give it another look before embarking on Andy Kaufman's unique take on the film as a 1983 work of videotaped performance art. Although it's easy in hindsight to just call Malle's film brilliant and it's riveting throughout-- when you get right down to it, it's also pretty damn bizarre-- alternately wacky, pretentious, fascinating, and while it's undeniably funny most of the time it feels like it's unintentionally so as we listen to a bunch of strange pre-New Age off-the wall stories back-to-back. Therefore it's no wonder that Malle's Andre would've captured the attention of the man who brought us Latka on TV's hit series Taxi. Latka or Andy Kaufman to the rest of us, staged his own take on the classic two years later during a breakfast encounter with an old friend and five time world wrestling champ Fred Blassie who not only dubbed himself the "King of Men" but also created the phrase "pencil-necked geeks." Meeting the literally frail "pencil-necked geek," Kaufman (who wears a neck brace throughout as he'd been seriously injured although even that was debated as well) for breakfast at the low-key diner Sambo's in Hollywood-- the definite odd couple take center stage among a restaurant filled with unsuspecting patrons. However, soon enough you realize that a few of those who sit nearest to Kaufman and Blassie were indeed as IMDb confirms "plants," when the men's conversation begins to drag and there's a combative encounter with a nearby table full of women. Already controversial for the TV star's obsession with wrestling and decision to wrestle women (having defeated four hundred in a series of matches) before a man threw his neck out of whack-- after about twenty minutes into the meal, germ-a-phobic Blassie and Kaufman cleanse their hands before eating. 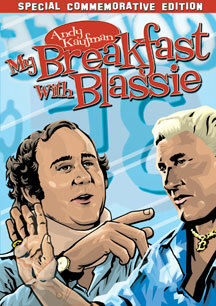 And while Blassie declines a request for an autograph and doesn't want to shake a stranger's hand, Kaufman reluctantly suffers through the encounter only to have an ongoing verbal and slightly physical battle of the sexes later on in the show when the women overhear their negative reaction to fan demands. At the beginning of the work, Blassie lectured Kaufman about thanking a worker for seating them at the table saying he's too nice and since the worker was just doing their job they don't need to be thanked. And soon enough and most likely spurred on by trying to impress the man he's obviously in awe of by requesting permission to remove his jacket and consulting Blassie about what he should or shouldn't order, the meek Kaufman unleashes a sexist tirade to the angry women before he comes onto the most beautiful one he and Blassie call "Legs." Incidentally "Legs" whom he meets on camera (and who indeed was hired for the performance) became Andy Kaufman's real-life girlfriend Lynne Marguiles so the amusingly staged first encounter of the two make it especially interesting for Kaufman enthusiasts as well as those who wanted to see more footage of the man after Jim Carrey and Courtney Love took on those roles with the release of Milos Forman's biopic Man on the Moon. While on the whole, the first half of the piece is superior to the second as it disintegrates into bodily function humor with another staged encounter with a mucus/vomit fan (who was in real life Andy Kaufman's writing partner Bob Zmuda). Likewise, while we know things were staged on Kaufman's end-- there's a creepy undertone in regards to Blassie's encouragement of Kaufman's misogynistic rant with the ladies that resonates from the beginning. Of course, the wrestling world is the opposite of politically correct but nonetheless Blassie was actually known as "Classy" in a rhyme that plays into his last name. Yet, while Kaufman never plays into this aspect of the piece since most likely the waitress was just doing her job or not in on the joke (and we wonder just how much Fred knew beforehand), the "classy" description is challenged as he constantly rubs the pregnant belly of their Thai waitress (whom he calls "Buddha"), joking that then they won't have to tip that much later on. And adding further insult to "icky-ness," this is before Blakes makes a few other statements that he's never seen a pregnant waitress or a pregnant Thai woman before until he finally makes a crack about welfare-- never giving a thought that perhaps like Blassie who is in fact married to a Japanese woman, the Thai waitress could be married or part of a supportive family unit. Uneven overall and at its best when the men just sort of ramble back and forth rather then when they resulted to the staged encounters or set-ups for action-- nonetheless it's of particular interest to fans of the "allegedly" deceased Kaufman who, much like Elvis Presley-- who's also discussed in the breakfast-- some believe pulled the biggest piece of performance art of his life when the world said goodbye to him in 1984 following a death by cancer that die-hard fans still question. The DVD arrives loaded with extra features-- most of which aren't really necessary especially considering that it's just a sixty-five minute piece of performance art with low-tech production values and was never intended to be a Malle style Dinner With Andre. Still, the interesting, inconsistent, yet worth-it-once for kicks disc arrives to mark the twenty-fifth anniversary of Kaufman's death. Or, as it could also be known, the year that marked the very last time he managed to make that sweet Latka smile and say "thank you very much" in between gigs as the goofy headline-grabbing pencil-necked geek who called himself the "Inter-gender" undefeated wrestling champion of the world.